The Dotul Assembly Table is used to pre-hang doors. 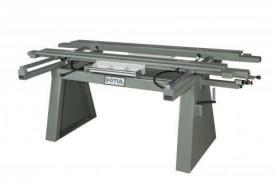 It is built with heavy gauge steel and has sturdy indexing bars for accurate width control adjustment. The Dotul Assembly Table allows the operator to accurately assemble door units with ease. The operator simply puts the door on the assembly table, clamping the hinge jamb in place and then adjusting the move-able side to the correct door width while inserting the strike jamb. A quick tap on the clamp button and the jambs are locked into place. Door Width 12" to 36" Option for 48"
Door Height 80" to 96"
Jamb Thickness Up to 1 1/2"
Assembly Table Dimensions W 62" x L 88" x H 34"